The sites in this tour represent Adelaide’s colonial past and stand as notable examples of the oldest built structures in the city. This tour includes some of the city’s best-known public and private heritage buildings, and reveals how some narrowly escaped demolition! Highlights include Ayers House, named for the prominent South Australian parliamentarian who resided there and notably the only remaining mansion on North Terrace, as well as Beehive Corner, a rare example of commercial Gothic Revival architecture in Adelaide and now home to South Australian chocolate company, Haighs. 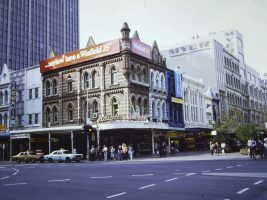 Also included in this tour is the Queen’s Theatre, erected in 1840 and one of the oldest theatres in Australia which was saved from demolition in 1973 thanks in part to a famous celebrity. For the most part, these buildings have to be enjoyed from outside as they are private residences and business which are not open for public viewing. However, Ayers House, which now hosts a museum and exhibitions, offers daily tours including the very popular Ayers House After Dark tours. The Adelaide Gaol also regularly offers guided and self-guided tours of the precinct and has a museum detailing the history of the site.